Learning how to create text effects in photoshop are a fantastic way to learn more skills. In today's video, Ch-Ch-Check It, teaches you how to Create a Medieval Metallic Text Effect Photoshop in this video tutorial. This Photoshop Text Effect Tutorial teaches you step by step how to create a cool Chrome, Metallic, Medieval Text Effect using easy Photoshop Tools like Blending Options, Gradient Tool and more! 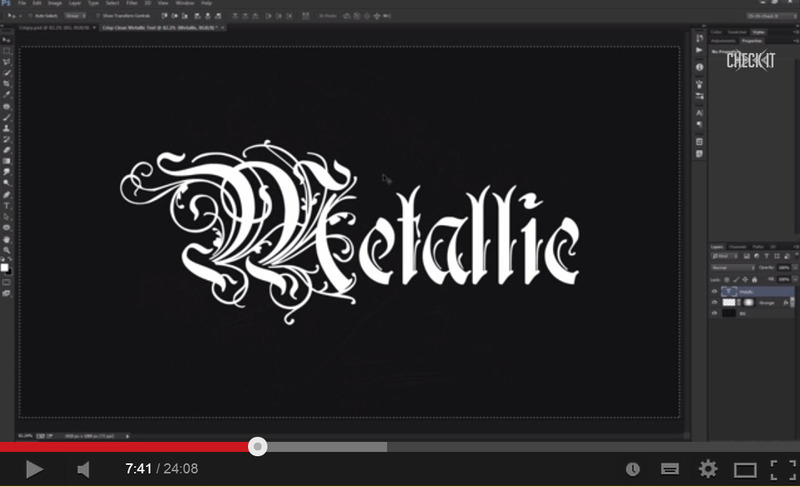 In this tutorial based off the tutorial from tutsplus.com, Brandon shows you how to create a great, stylish, metallic-styled text effect! This Metallic text effect is perfect if you're looking to create something retro and stylish, Lots of gradients help build up the effect of highlights, while the reflection along the centre of the text is typical of this style of text effect.We hope this Create a Medieval Metallic Text Effect Photoshop [Tutorial] helps you to learn more skills when creating fantastic Photoshop Text Effects. Firstly a new canvas is created with a size of 1920×1080 with a 72 Pixels per inch Resolution. 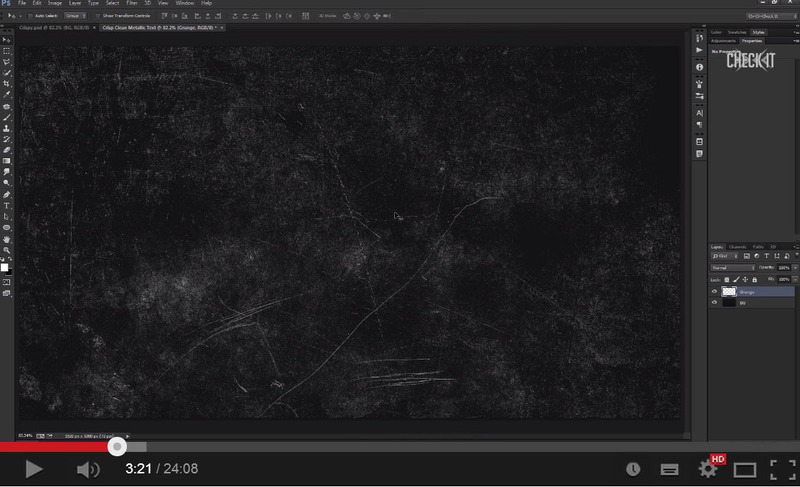 A grunge background is then created using the FIll Bucket tool to fill it dark grey. Texture is then added using the Grunge Brush Set. This is a great way of creating textured backgrounds, especially if you don't want to use a textured premade image. The text is written out using a decorative font. using the Character Box he makes some changes to the letterspacing. He then centers the text by pressing CTRL+A to select the canvas board, using the centering options on the photoshop interface he aligns the text layer center. Blending Options are then used on the Text Layer by right clicking the layer and clicking on Blending Options. A number of Blending Options are used including Bevel & Emboss, Stroke, Inner Shadow, Satin, Gradient Overlay, Pattern Overlay, Outer Glow and Drop Shadow. 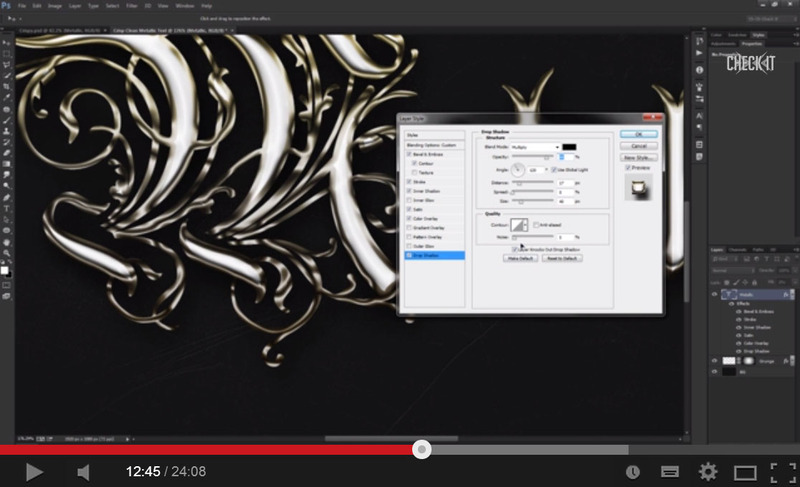 A new Gradient Fill Layer is created with a Dark Grey Gradient over the previous layers. The text layer is then duplicated and a Radial Blur is place on the layer, the Blending Mode is changed to Linear Dodge with the Fill down to 15%. The video then trys out some extra styling to can test out and make it your own! 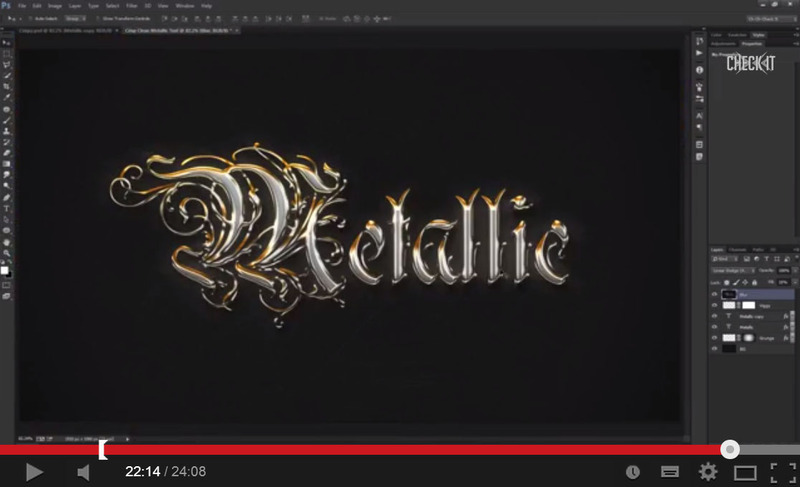 In this tutorial, Ch-Ch-Check it, will take you through the process of Create a Medieval Metallic Text Effect Photoshop [Tutorial], and show you how to create a shiny and metallic text effect. Let’s get started!